Naomi and I are excited to share our 2nd Easter craft. We aren’t sure though if we should feel slightly embarrassed that we used & saved so many toilet paper rolls or proud that we cutely repurposed them. We didn’t even have to ask hubby aka Dad to save them, he was already setting them aside. Oh, how he humors us. The craft came out so nicely we’re going with PROUD here. The garland features a simple bunny face or a more detailed one, cute bunny tails and colorful paper rolls. Friends, it's recycled, repurposed, bold, sweet, slightly geometric, a bit time consuming but Oh So. Darn. Cute. 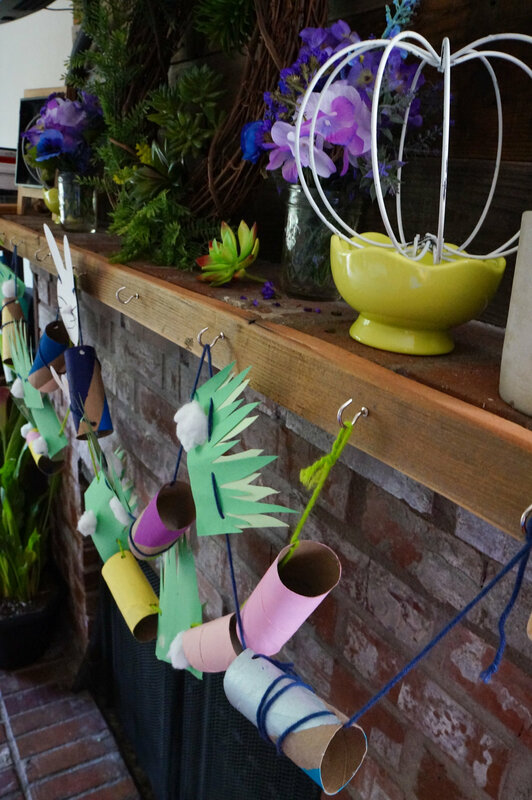 Naomi and I made our garlands a little differently, I’ll share how we each completed ours. Start by taping diagonally, vertically or horizontally and painting the 1st color or painting completely if deciding against the stripes. Naomi chose a diagonal stripe for 2 of her rolls and left the other 4 untaped but did add a few polka dots to the striped ones. When paint is dry, remove tape and paint the exposed roll. Then set aside. Optional: Add tape to the outer edges of unpainted area before proceeding to ensure even lines. Start on one end and lay tape across diagonally. Add a second piece in the opposite direction, making sure the ends meet. It creates a V shape. Paint both sides in different colors or same ones. When dry remove the tape and paint the stripes. While your rolls dry you can move on to the next steps. Fold your construction paper in half and glue together. This ensures you’ll have a sturdier bunny. Use a mug/small bowl to trace the bunny face. 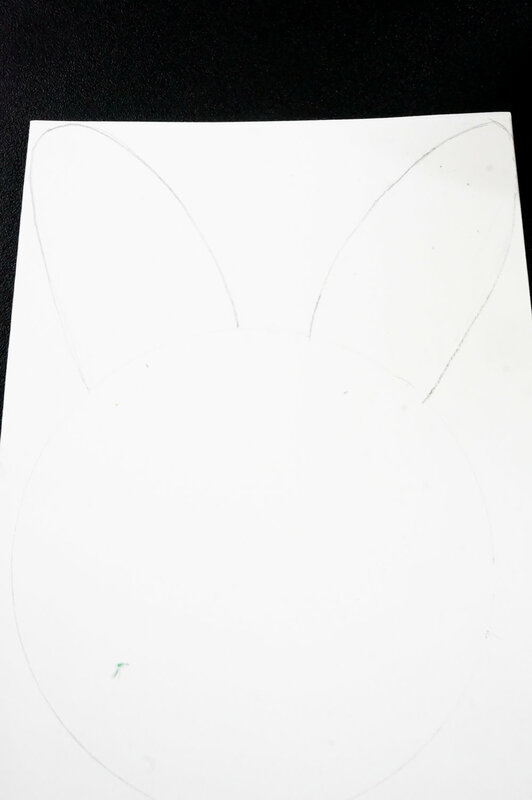 Simple Bunny: Cut thin strips of black paper and glue near the center of the face. Tear a small piece of cotton ball for the nose, glue on. Detailed Bunny: Paint the pink inside the bunny’s ears and on cheeks (not pictured), draw the mouth & whiskers(not pictured) and lastly glue a small painted cotton ball. Fold your dark and light green papers and draw grass. You can cut out 1 grass and use that as guide for the other papers. Cut out grass, cut edge to separate the 2 pieces and then alternate sides before gluing 1 dark green and 1 light green together (4 sets). We chose to display the dark green over the light. 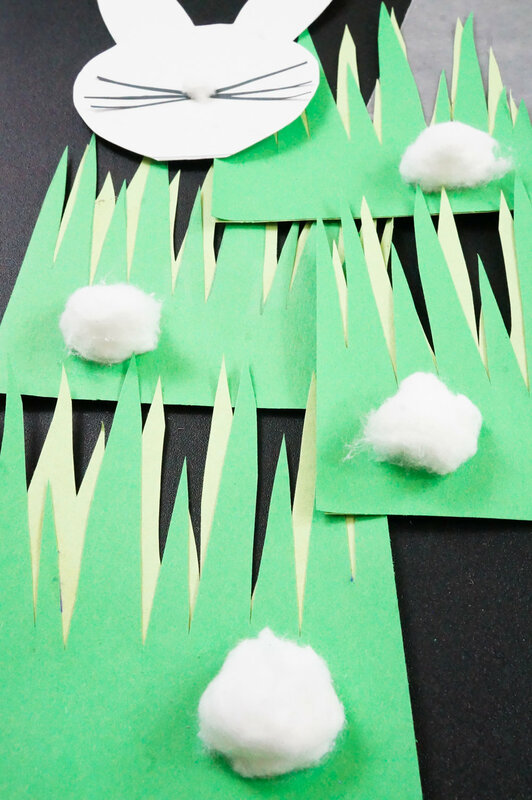 Split the remaining 4 cotton balls in half and glue 1/2 on the front of the grass (right or left side works best). Glue the other 1/2 on the back, *on the opposite side (Shown below). *If you glued the ball on the front right, glue the other one on the back left. This helps to balances the weight of the ball when hanging. If you haven’t removed tape yet, make sure to do that before punching holes. 4. Punch 2 holes in the rolls, 2 holes in the bunny faces (Naomi chose to punch 2 more holes as eyes), and 2-4 holes in the grass. 5. Cut about 5 ft. of yarn/twine depending on how long you want it, how much space you’d like between the items and lastly, whether you’d like to wrap some yarn/twine around the rolls as I did. 6. Thread your yarn/twine through the bunny and make sure your string is even before alternating the other items. Feed the string through the outside to hide it or the inside if you want to display/wrap it around, before feeding it back in and out. 7. When you get to the end, loop the string back into the hole a 2nd time and tie. Happy Easter and happy crafting friends! To share: take a photo of your garland, click on photo submission and submit the photo.